Oh, is that a CHOCOLATE EXPLOSION? An abundance of chocolate can be found, however, just before Valentine’s Day. This is a celebration in which, conversely to Western practices, women give chocolate to men. Given that when I have visited any dessert or chocolate cafés/shops, they are almost always exclusively populated by females, I wonder if this practice acts as a form of cultural legitimation that permits men to enjoy chocolate at least once a year. They say ‘when in Rome, do as the Romans do’. Well, I can tell you straight away that there is no way in hell (or the entire universe) that I’m giving chocolate away. Oh no, it’s going to go gliding down my greedy gobbling throat. With emphasis on the glugging noises. 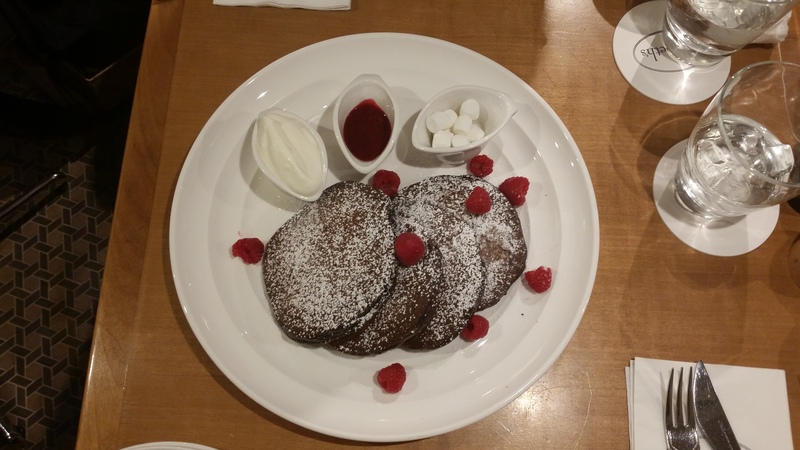 And so, without hesitation, and shamelessly two days before an exam, I ran off to Sarabeth’s in Daikanyama for their Valentine’s Day special, known as the Chocolate Explosion. If you’re a chocoholic, and I’m assuming you are if you’ve read this far, you ought to hop over there too, because this indulgence is only available until this Sunday (February 15th). Daikanyama is a trendy area that I’ve yet to explore properly, but I am fearful of doing so: it’s the kind of place that will dent your wallet. Cute galleries, stylish cafés, independent designers. It has a beautifully large Tsutaya book store, where, Starbucks in hand, you can fight with hundreds of others wanting their reading/study space among the books. Thus, it is only fitting that the ‘No.1 Dessert Restaurant in New York” and “The Breakfast Queen of New York” has chosen to set up shop there. The second floor café occupies a colourfully-tiled building just round the corner from Daikanyama station and carefully channels its chic café chic from the smartly dressed staff to the weighty cutlery. As for the menu, think Eggs Benedict, Fluffy French Toast and Grilled Rosemary and Lemon Chicken Sandwich, which at 1750 yen, ought to be no less than life-altering. So, without messing around, I got a mango juice (520 yen) and a Chocolate Explosion (1450 yen). My friend advised us to share as the portions were renowned for being large. My initial reservations were wiped away when an entire chocolate landscape appeared. 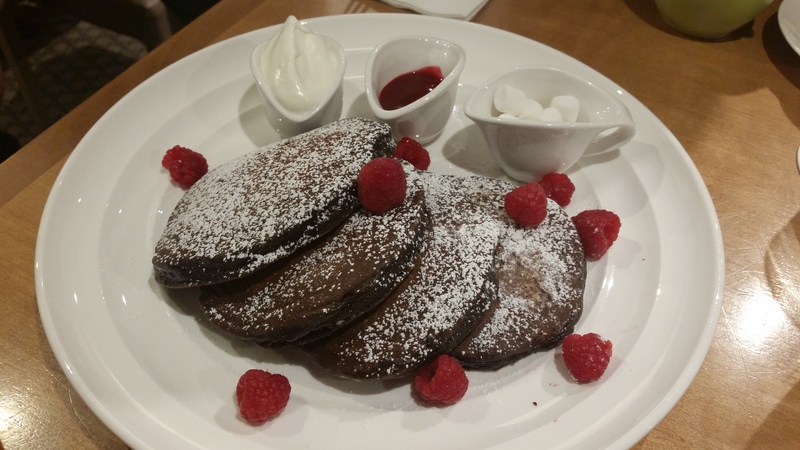 A Chocolate Explosion consists of not two, not three, but four incredibly soft chocolate pancakes, filled with a light chocolate sauce. On the side is cream, a raspberry sauce, mini-marshmallows. Needless to say, it was absolutely divine. The tartness of the raspberries cut delicately through the cocoa sweetness and the cream added a smoothness to each mouthful. I personally could have doused the whole lot in more raspberry sauce and cream, but the pancakes never became too dry. Is it worthy of the title Chocolate Explosion? Probably not, as it is not an intense chocolate experience. 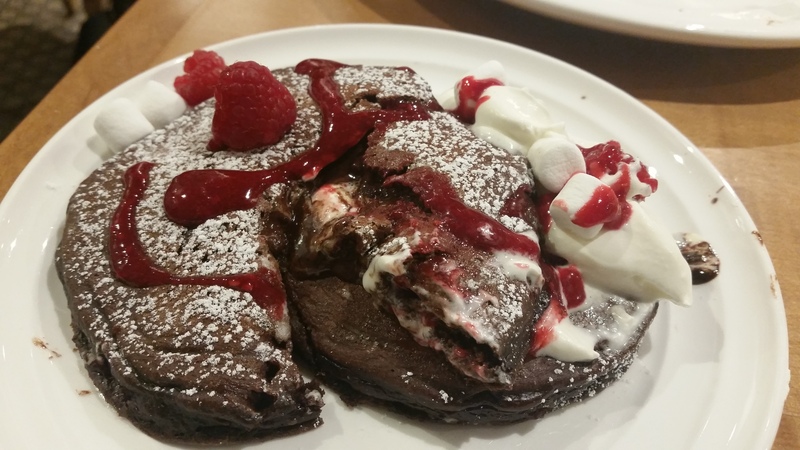 In fact, the pancakes and chocolate sauce are so light that it would be definitely be possible to eat all four pancakes without feeling over-sweetened. It’s an expertly crafted dish, and therefore it’s not for those craving a crude chocolate injection. Should you go and eat it anyway? YES. It’s delicious in its own right. But you only have until Sunday February 15th. HURRY! Max Brenner has the chocolate pizza available all the time. Magnolia cupckaes has good brownies, but might be a bit on the sweet side. Cote Coeur in Ebisu is a brownie specialist and the earl in Akasaka has excellent ccb (chocolate chip brownies!!!!!). YOu don’t need to spend a lot of time looking for a chocolate fix in Tokyo. I would argue that it has more chocolate per capita than places like New York City. I’ve never fancied the chocolate pizza at Max Brenner to be honest… Ahh but knowledge of brownie specialists is good – thank you, will be heading to these places asap! And yes, I do agree there’s a lot of chocolate about… it’s just a question of how intense and chocolatey that chocolate is! Not very, I often find.